Built two years ago in Calistoga out of 14th century stones, bricks and beams, with reinforcing and modern amenities tucked out of sight, Castello di Amorosa is a faithful representative of an ancient Italian castle. Sentries wearing the garb of ushers forsook their crenelated guard towers to guide us into the Great Hall, a stupendous beamed chamber which would comfortably hold my house. Down a stone staircase tasting and storage rooms occupy the space under the Hall, columns and groined vaults supporting the tons of rock above. The rounded sweep of carefully squared blocks displayed the skills of the 150 European masons and builders who were employed, and who taught their skills to an equal number of locals. What a vision to faithfully reproduce this! Or strange folly. But the inner courtyard as a setting for chamber music was pure magic. As the westering sun drenched the stones in red and gold, swallows darted restively, waiting for evening insects to emerge. With its stone walls and ceiling of air, the courtyard had some of the balance of clarity and resonance for which sound studios strive. 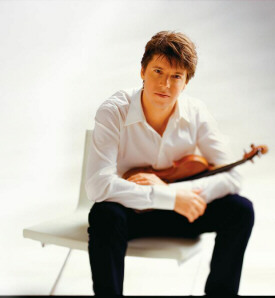 On Wednesday night, July 16, celebrating more great music at Napa Valley’s prestigious Festival del Sole, living legend Joshua Bell performed Grieg’s Sonata No. 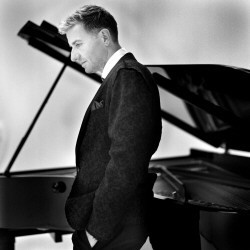 3 in C minor for violin and piano, accompanied by another classical luminary, Jean-Yves Thibaudet on piano. From the first deeply bowed note and fast triplets violin and player shone: the 1713 Stradivarius was robust and chesty in its lower range, and Bell’s triplets were crisp for all their fierceness. Thibaudet matched Bell with dynamics that ranged from softly reverent to almost brutal. The middle movement—haunting, innocent, hugely sentimental—is the heart. In a Leila Josefowicz recording of the Grieg, something curious is revealed. Her phrases are played at tempo, rounded where Bell weights each phrase with passion. By restraining her own voice, Josefowicz lets us enjoy both phrasing and the larger architecture of the sonata. Stepping back from brilliance may be particularly appropriate when performing Grieg, whose writing, like Norway’s nature, has its own subtle flow. The last movement is dance-like and visceral, with phrases volleying back and forth between violin and piano. The bowing deepens and phrases turn harsh, almost bitter, over rippling piano arpeggios. Thinking of Grieg interpreting nature, and Bell and Thibaudet interpreting Grieg, I watched the sun slanting across stones, outlining the raked joints in black shadows. This was one of the finest laid walls I have ever seen, and I began to appreciate how masons can spend years laying one rock on another, giving the lines weight and flow and thrust. Opening the concert Gordon Getty appeared in person to hear the premiere of his Four Dickinson Songs, set to Emily Dickinson texts. Kristin Pankonin lent a sepulchral quality to the quiet drawn-out piano notes, and Lisa Delan’s light soprano was fluid and easy to understand. She slid into her notes, sipping where others bite, and her pianissimo finish lent some continuity to the pieces. After an intermission Thibaudet returned to join the Rossetti String Quartet in Brahms’ Piano Quintet in F Minor, op. 34, a monumental work that was performed to the highest standards. The balance between each artist’s gorgeous sound and the lively interplay and tight harmonies of the group were exactly what Brahms requires, with his yearning gypsy modes, the great slow warmth and delicacy of the Adagio, the sternly uplifting Scherzo, and that roller coaster Finale. Afterwards, while Thibaudet was graciously signing a CD for me, I overheard Bell seated next to him, saying to a young girl, “Sign your violin? I don’t know. It’s a very nice violin.” He turned it over a couple times, frowned, then, at her urging, signed with a Sharpie at the neck. I should have brought my piano.